Transformers: Dark Side of the Moon is the third film in the highly successful movie series, produced by the legendary Steven Spielberg. Not that thousands of boys will care two about the credits; all they will want this Christmas is the new Optimus Prime figure, in his own mega trailer. Optimus Prime has defended numerous worlds against the dreaded Decepticons, but Earth is the first place he can call home after Cybertron, and he will defend his adopted world, come what may. 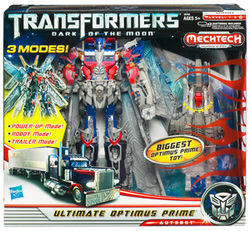 The new Transformers 3 movie finds Optimus Prime driving into battle with his weapon trailer, that converts into a Mech Suit to power him up for the battle against the Decepticons. Like this hot Christmas toy, but looking for something more active? Try a Nerf Nite Finder!